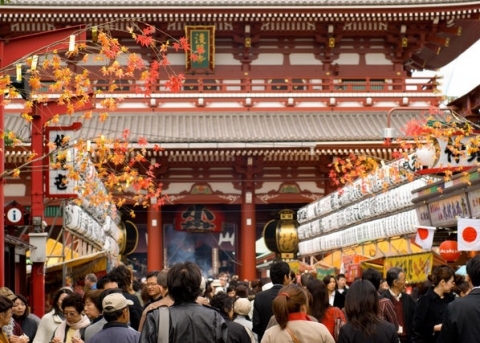 Passing through the Kaminarimon gate – the famous symbol of Asakusa in Tokyo – you will see a shopping street Nakamise, at the end of which stands the temple Sensodzi. 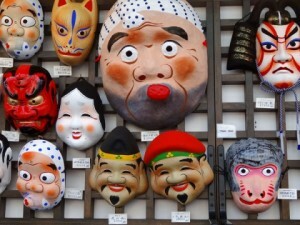 Nakamise is the street length of 250 meters – from Kaminarimon gate to the second gate of the inner Hozomon – which has settled countless shops, restaurants and stalls, many of which can boast of a very long period of existence. 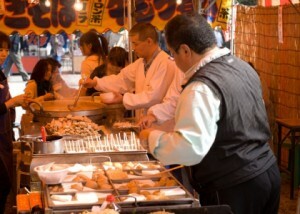 Here, you can anywhere else like to feel the spirit of old Tokyo. Goods for sale are calculated as local buyers and foreign tourists: various ornaments, traditional Japanese kimono and yukata, wooden doll, colored paper crafts chiogami, folk art, historical postcards with images of Asakusa in Edo period (1603- 1868. ), magnets, chopsticks and much more. Of course, impossible to ignore, and Japanese cuisine provided here in all their diversity: odango sweet balls, soba and ramen noodles, ice cream, sweet potato, stew Oden, etc .. It is not surprising that at Nakamise-dori is always a lot of people. 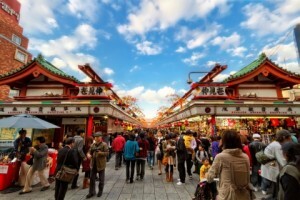 It is believed that the Nakamise-dori – one of the oldest shopping streets in Japan. When the power of the country into the hands of the shogun Tokugawa Ieyasu, in the era Sengoku (1493-1590 gg. ), And Edo shogunate was founded, the population of Edo (Tokyo then) was to grow rapidly.Many traders began to open shops and stalls near the popular temple Sensodzi – that gave rise to the famous shopping street Nakamise.